No! You can’t take that away from me! In amongst the swirl and the noise created by the suggestion of “Global Funding” and “COOLs” and other things in the Education (Update) Bill currently before the house, a really tragic change is about to be visited upon the school system and yet I hear no cries, of “Stop!” or allegations that the very heart of our traditions are being destroyed. No, just a silent acceptance. I refer to the proposed change that gives to Boards of Trustees and Principals the right to decree that children reaching the age of 5 years might have to start school at the beginning of the next term rather than on their birthday. Since the beginning of history going to school is what you did when you turned five. Any four year old, when asked about the forthcoming birthday, will reply to the question “What happens then?” with a bright and cheerful “I go to school!” “And what will you do when you get there?” the conversation continues. “I will learn to read and write!” is the confident reply from one who has yet to discover that learning is not always a piece of birthday cake! Most New Zealand homes have photos of the respective first days at school – nowadays often showing the poor little person in a grotesquely large school uniform that they will “grow into” sometime in the years ahead! 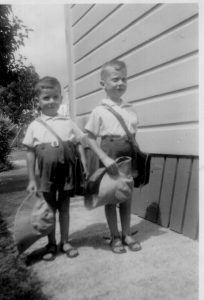 My own mother made sure that my twin brother and I had a photo taken – new shirts, new shorts, new sandals, new school bag and a sun hat large enough to camp under. It was a significant day not just for us but for Mum and our older brothers one of whom still went to the primary school. For one day of the year we were important. And when we got to school we joined a class of other little people but we knew some of them – they were from the neighbourhood. Others had been there a little while and could look after us – they knew the ropes. Miss White the teacher, a tall woman with a big boot on one foot paid special attention to us and the day went well. Actually this was not taken on my first day at school but the day before. This was because we were going to be too busy on the morning of our first day according to Mum. But so important was this day that Mum, who had something of a feel for events which she would describe as “history” and therefore accuracy was a critical. After the first photo taken on this gloriously sunny February day in Hamilton we had to go and dress up in our wet weather gear in case it was raining on the first day at school! 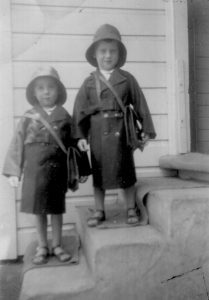 I always had my twin brother with me so never felt lonely or lost but what a relief it must be when a five-year old first goes to school to have the help of others in the class. Teachers make very effective use of this – “Tommy, will you show Stuart where the toilet is?” Imagine the chaos of a whole room full of newbies, five-years old, all having left their mothers or fathers, milling around wondering what to do, where should they be, and when is “Mum / Dad / Carer / Au Pair” coming back to get me out of here? It will be like a paddock full of lambs after they have had their tails docked and have not yet been reunited with the Mummy Sheep. Once again, schools are to change their way of working to suit the grown-ups rather than taking account of the needs of the children. Once again we are doing something because Australia has done it – the old let’s-copy-someone-else rather than have the courage to do it our way. Voltaire once said that “when it is not necessary to change it is necessary not to change.” Rather than simply promote the change, let’s have some reasons why it is necessary from a five-year old’s point of view to change our tradition of introducing young ones to school on their fifth birthday. Success in Education – The Only Lifetime Guarantee that Matters! So Youth Guarantee is not working according to those TV experts (TV1, Sunday, 18 September 2016), a view supported by some political statements, refuted by others, and brought to the attention of the education community by Ed Insider (19 September 2016). A key reason for giving young people the opportunity to continue their education and training up to the age of 19 years without cost to them is one of providing an equitable opportunity for them to have positive outcomes. It was always wrong that students could stay in a school up to the age of 19 years and fail elegantly for free while a decision to leave at 16 years (when they legally can) to pursue their education and training in a place other than a school would cost them a great deal. Why should schools have a monopoly on free education up to the age of 19 years? Then there is the clear truth that many 16 year olds are ready to leave school and get on with a career especially if they perceive that their chances of scholastic success in a school setting are not strong. So many of the Youth Guarantee students who pick up the opportunity to continue at an ITP might not be the strongest group of students, but many will discover strength as a learner when they are immersed in an applied educational setting. The whole point of understanding a multiple pathways approach to education is to see the value in students’ being able to match the pathways to their needs, their aspirations and their views of where they are headed. The TV News reporter and others have complained that “they do not stay in the course”. A simple enquiry would have enlightened the commentators to the fact that one of the key outcomes for YG places is to see them undertake study at a higher level and that is usually not a YG fees free place. The fees free place is a point of entry. Actually the successful outcomes, while they do vary somewhat between providers, are in many instances above 75% of students and Māori and Pasifika close to these levels. These are typically students not likely to achieve these results in a school setting. The outcomes for trades academies should be viewed a little differently as many students undertake a trades academy programme at Year 12 and return to school for Year 13 with renewed engagement – a positive outcome. Nationally students in trades academies are out-performing comparable students in the schools. The growth of secondary / tertiary programmes is an important channel through to employment but it is an even stronger weapon in the fight against the western education systems’ ugly statistic – those who drop out completely – and join the group called NEETs (Not in Employment Education or Training). It will take a raft of initiatives to first stem the flow of young people into that group and then undertake the huge task of moving those already in the NEETs group on into productive employment and a better life. The Youth Guarantee policy setting is not a panacea for the considerable issues education faces, nor is it on its own going to meet the BPS goals. But it is working for a considerable number of students who do not deserve to have such opportunities denied them because of the ideological whims of others who have benefitted from a sound education. 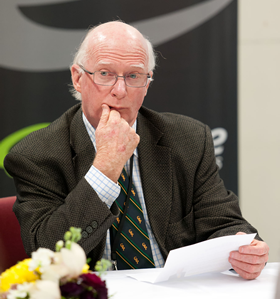 Giving young New Zealanders a guarantee that their education will prepare them for a satisfying life, a family sustaining wage and an opportunity to make a useful contribution seems the least we can do. The Tertiary ICT Conference theme for this year is Bring IT On which focuses on identifying and sharing the key issues and opportunities for ICT in secondary and tertiary education, now and into the future. A must for those in ICT Management, Teaching personnel and Service delivery teams. A generation that loves COOL! I have always felt that the teacher who thinks they can be replaced by a computer ought to be! The response to the recent announcement of COOLs drew some superficial, hysterical, and quite astonishing responses. The announcement was characterised variously as a conspiracy to privatise education, to diminish the importance of teachers, to put our education system at risk and to fail many students. Again, the quick default to opposition of an idea showed its ugly side. It seems to me to be a truth that, in some ways, COOL is already here and that most young people are already deeply immersed in it. Their “communities of online learning” encompass many of the concerns that young people have, the circles of friends that they make, their points of engagement with a world-wide web that takes them to places far more enriching, challenging, and rewarding than a school environment could ever hope to be. The sadness is in the extent to which schooling so often stands to one side of this and offers the conventional as an antidote to what it seems to suspect, might be poisonous. On the other hand, simply importing a kind of embrace with on-line learning could be dangerous. The post-secondary world of learning internationally has shown through its MOOCs what a sham it could all be. I enrolled in a MOOC at the University of Edinburgh. Never have I been so warmly welcomed instantly, never have I had so many friends in such places as Nigeria, Luxembourg, Belarus and even Greenland in the various chat rooms, never was I more excited about learning. Excited I remained until I got delivered into my computer the first session. A talking head, reading from a script took me through material in a manner that transported me back to my university experience in the 1960s. This was repeated in all seven sessions in the course, the only difference each time was a change of talking head. We had a set text as well. Yes, you guessed it – seven chapters written by seven lecturers and sold on Amazon! If a school and the teachers in online instruction harnessed the skills they have as teachers and as people and used them to enhance programmes they will be needed in the learning process more than ever. The flipped classroom, the new pedagogy, the 21st Century learners, each demand an increased quality and variety of interaction between teacher and learner even though the delivery of content and the activities to make learners comfortable with managing the course materials and content will be accessible to anyone, anywhere, on time and on-line. Those last few words seem familiar. They should be! They are the commitment of NZQA to deliver assessment to anyone, anywhere, on time and on-line. When teaching programmes are freed from the tyranny of place and students are free to experience the encouragement of assessment arriving at the point at which it is most needed, the world of education will be a very different place. And it is difficult to see how this will not happen. There is inevitability about the power of IT to transform the processes of banking, retailing and the practice of medicine, to simplify access to music, to books and to information, to enhance and ease the interactions between friend, colleagues, customers and, yes, bullies and those at risk – human beings are a lumpy lot! Perhaps this process had started some time ago in our schools with the uses made of computers, devices and the technological advances in instructional technologies. The COOL announcement might well be a useful wake-up call. There are enough young people alienated from learning and education without inviting those already comfortable with a community of on-line learning to join them. I keep useful papers and bits and pieces in a loose collection but have not always been punctilious about noting the sources. Well that is not good enough and quite inexcusable when sitting at a computer! I set about using my skills and discover in a few seconds that the paper referred to above is in fact “Why School Reform Is Impossible” written by Seymour Papert which appeared in The Journal of the Learning Sciences, 6(4), pp. 417-427. Now, finding that out so quickly is very cool!